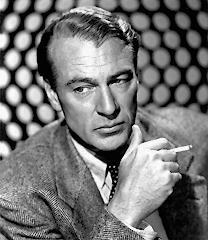 Gary Cooper (May 7, 1901-May 13, 1961) routinely played heroes, either in Westerns or war movies. He developed an image as a stoic, dependable man of the people, which suited his relaxed yet powerful screen presence. Several of Cooper’s most famous movies include Mr. Deeds Goes to Town (1936), Sergeant York (1941) and High Noon (1952). A natural, rather than trained actor, Cooper always felt uncomfortable in costume dramas, and avoided them. Frank Cooper was born on May 7, 1901 to British immigrants living in Montana. His father practiced law in a small town, and his mother hated Montana. Since both of his parents had emigrated to America as adults Cooper was raised in a British home but he also experienced the last vestiges of the frontier in the nearby town of Helena, where he saw Indians, cattle rustlers, and whorehouses. More important, he grew up surrounded by a generation that remembered taming the land, including range wars, mining booms and battles with Indians. When Cooper was five, his father bought a ranch of 2,600 acres fifty miles away from Helena, so he went to a one-room-school on the ranch with a dozen white and Flathead Indian kids, and grew up roaming around. In 1909, Cooper visited England along with his parents and older brother. Cooper’s father now viewed America as his country and went back, but the children stayed to study in England because his mother worried that her sons were becoming savages. Unlike his older brother, Cooper did not feel comfortable in a posh, upper-class school, but it did instill in him a respect for tradition, conformity, patriotism and a conservative political attitude. Three years later, they returned to Montana, where his classmates’ ridicule quickly made him lose his English accent, and he was put back a year because of differences with the British education system. He later took two years off from school to work as a cowboy on the family ranch. Actually, he had a lot of trouble graduating from high school because he had few academic interests aside from art, and he was three years older than his classmates. Cooper worked his way through university but left during his second year in order to start his career as a commercial artist. Cooper tried to get a job as an advertising artist in Chicago, and moved to Los Angeles because he felt that he should starve where there was no snow, neglecting to mention that he could live with his parents who had already moved to Hollywood. Actually, despite later press releases, Cooper went to Los Angeles hoping to break into the movies. He first found steady work as an extra for westerns on Poverty Row, taking falls because they paid more since they were more dangerous. He changed his first name to Gary because his agent told him that there were already two other Frank Coopers working in Hollywood. Cooper’s gentle nature and reputation for stamina quickly made him a success with starlets and secretaries, partially because he actually paid attention to them. A supporting role in The Winning of Barbara Worth (1926) won him a Paramount contract, but his career continued to grow largely because of his romance with Clara Bow, who summed up their relationship with the delicate comment that “he is hung like a horse and can go all night”. She got him a number of minor roles in her films, including Wings (1927), but their intense relationship ended because Bow felt that Cooper’s mother ran his life, and she had fallen for director Victor Fleming. Lupe Velez was another more successful actress who soon took her place as Cooper’s lover. Another passionate love affair ensued but, like later affairs with Marlene Dietrich and Carole Lombard, it failed to crack the hold his mother had on his life. It is interesting that both Bow and Lupe were complete opposites of his mother. As a rising new star, the introduction of sound was an opportunity for Cooper since the careers of many more established stars like Clara Bow and John Gilbert went into decline, while he somehow appeared to be a combination of romantic idol Rudolph Valentino and cowboy star William S. Hart. He played the lead in The Virginian (1929), the first major sound film shot outdoors, which made him a big star, while Morocco (1930) confirmed his star status, and showed that he could handle sophisticated roles. He also found time to have an affair with his co-star, Marlene Dietrich, despite the constant presence of his girlfriend Lupe on the set. He then had an affair with Carole Lombard while he was still with Lupe. The stress of his chaotic love life combined with his heavy work load resulting from the studio’s efforts to squeeze as much out of his contract as possible forced Cooper into a minor breakdown in 1931, and he lost 30 pounds. Feeling exploited by the studio, he went to Europe on vacation. Walter Wanger suggested he meet Countess di Frasso in Rome, a rich and extremely well-connected socialite, who was thirteen years older than Cooper. Her villa was one of the social centers of Europe, and offered week-long parties. Out of range of his possessive mother, the Countess was able to introduce Cooper to fine restaurants, art and her bedroom. The lifestyle of a gigolo proved attractive, and Cooper stayed in Italy for months before returning to America for a month to make a movie, and then going on a safari with the countess in Africa. However, it appeared that Paramount had grown tired of wooing him to return to work, and had found a real Englishman, Cary Grant, to replace him. Fortunately for Cooper, Paramount welcomed him back with open arms when he returned from Italy even though the studio was experiencing a financial crisis, and was purging employees. The countess followed him to Hollywood, and eventually had a fling with Bugsy Siegel in 1933, which introduced the gangster to the Hollywood elite. Cooper’s films made during the first couple of years that he returned to Hollywood are merely average but by 1932 he had become the center of gravity among Paramount’s stable of stars. He met Veronica (Rocky) Balfe when she was a bored socialite trying out acting for fun. Her acting career never went further than a few small roles but she began dating Cooper. Unlike the actresses that he was used to, she made him work for it, and they were married on December 15, 1933, several months after they first met. He was thirty-two-years-old and she was twenty. Rocky quickly became one of the leading socialites in Hollywood, and just as quickly ended his mother’s control. Actually, a good comparison can be made between Cooper’s on-screen and off-screen personas, they both abandon tainted Mexican mistresses to marry a pure Anglo, just like Cooper left Lupe to marry Rocky, whose social connections enabled her to overcome Cooper’s domineering mother. As the Depression gradually ended Paramount’s finances improved, so Cooper’s salary rose from $85,000 in 1932 to $258,000 in 1934 and $370,000 in 1937. Lives of a Bengal Lancer (1935) was an extremely popular movie, and he followed it with two more hits in 1936: Desire, where he proved to be skilled at comedy, and Mr. Deeds Goes to Town, where he created his common-man image. This man-of-the-people image was further developed in Meet John Doe (1941), Sgt. York (1941), and Pride of the Yankees (1942). 1936 proved to be an outstanding year for Cooper since he made two more successful movies, The General Died At Dawn and The Plainsman. Despite having made four hits in one year, Paramount dallied in renewing Cooper’s contract, and Sam Goldwyn managed to get him to agree to make a movie a year for Goldwyn, while continuing to work for Paramount. However, the good streak ended when he made Marco Polo in 1938, his only attempt at an Errol Flynn-type role. Cooper quickly realized that he hated pretending to be larger-than-life and wearing silly costumes, and he never made another costume film. This decision was reinforced when it turned out to be a financial disaster. His career entered a slight downturn between 1937 and 1938, when four movies in a row lost money but his career was back on track once he returned to the adventure and western genres, making Beau Geste and The Real Glory in 1939, and The Westerner and North West Mounted Police in 1940. 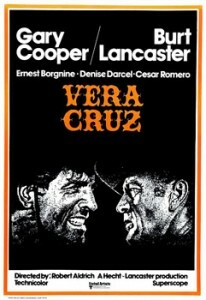 These movies also reinforced Cooper’s image as a rugged individual that made him so popular in America. He followed these movies with Sgt. York (1941), the biggest hit of the year that earned Cooper his first Oscar. Cooper had much in common with Clark Gable, his opposite number at MGM, including financial dependence on older women, and they maintained a friendly, yet intense, rivalry. When Gable bought a custom-made 1930 Duesenberg, the most expensive car at the time, he insisted that it be made one foot longer than Cooper’s. The two men were both avid hunters, and were often seen huddled together at parties discussing the merits of cars and guns. Cooper was part of the Hollywood Hussars, a reactionary group with fascist sympathies founded by William Randolph Hearst, which claimed Ward Bond and Victor McLagen as members, from March-June 1935, until his agent convinced him to get out. The group did little more than parade around in fancy uniforms, practice military drills and parade at social events. Unlike his former fellow members of the Hollywood Hussars, Cooper saw Nazism firsthand when he visited Berlin in 1939 with his father-in-law. The war-mongering that he observed convinced him to shed his isolationist stance, and he declared that the United States should become more international. While he became more outspoken, he did not actually do anything. Cooper was one of a tiny minority of stars who resisted the urge to enlist after Pearl Harbor even though he was only forty-years-old. Instead, he believed that actors could help the war effort best by making war pictures, since the more taxes an actor paid, the more he helped to win the war. Like Spencer Tracy, Cooper did one five-week-long tour of Army bases in the Pacific to get it off his conscience, and the tour made him familiar with military speech, which he used in later films. Oddly enough, he felt that Hollywood should keep politics out of movies, and he regretted making The General Died at Dawn. A confirmed skirt-chaser, Wendell Wilkie and Cooper became great friends, and Cooper later supported Wilkie because he felt that President Franklin Delano Roosevelt (FDR) was too powerful. Cooper first entered the list of top ten money-making stars in 1936, and despite four commercial failures in a row in 1937-8, Cooper made half a million dollars in 1939, and was the highest paid employee in the United States. He had never known poverty and he was one of the highest paid movie stars in the 1930s, so he was a committed Republican who hated FDR and the New Deal. He frequently spoke out against FDR but continued to play the champion of the common man on screen. It is interesting that Cooper developed conservative politics, since his father had served on the Montana Supreme Court from 1918 to 1924, and he stood out for the time because he regularly judged in favor of workers’ claims against large corporations such as the Northern Pacific Railway. Most of Cooper’s social and professional circle, including his wife, was conservative and anti-communist, so it should not come as a surprise that Sam Wood persuaded Cooper to join the Motion Picture Alliance for the Preservation of American Ideals in February 1944. He also supported Thomas Dewey against Roosevelt in the 1944 election, and was almost the only major star to openly oppose Roosevelt, paying for radio time where he claimed Roosevelt was not honest. Cooper voluntarily agreed to give testimony to the House Un-American Activities Committee (HUAC) during the first week of hearings, and he was a big hit with the committee, while his participation gave the committee dignity. He had actually worked with a number of the people named as communists and had never expressed any objection to their politics, but he let his friends do his thinking for him. However, he was smart enough not to name names, and simply ensured that he looked good by cooperating with HUAC. When the terror of the blacklist swept through Hollywood, Cooper apparently regretted aiding HUAC, and hired people who had been blacklisted, even though he believed that writers had been allowed to put too much propaganda into films. Although he never apologized for testifying, he has not really been criticized since he is perceived as having gone along with the right-wing flow. More important, he had refused to give specifics or name names. Like many stars in the postwar era, Cooper received a percentage of the profits. He had been a free agent since his contracts with Paramount and Goldwyn ran out in 1942, and he had had his own production company from 1944 to 1946. However, he still did not feel independently wealthy and wanted the security of a long-term contract so he signed with Warners in October 1947.
Cooper made Saratoga Trunk (1945) with his For Whom the Bell Tolls costar Ingrid Bergman in order to continue their affair. Actually, there is a debate over how comfortable Rocky was with Cooper’s affairs since he became less and less discrete, although the press was less intrusive then, so it was not in her face. By this time they had been married for ten years, and they had a five-year-old-daughter, so Rocky was willing to put up with quite a lot to remain Mrs. Gary Cooper, as well as avoid the public stigma of a divorce. However, things came to a head when Cooper started an affair with Patricia Neal. He had met Neal, who was twenty-five-years younger than him, when they co-starred in The Fountainhead (1949), and he made Bright Leaf (1950) to continue their affair. Cooper and Neal went to such lengths to keep their affair secret that when a horrible car crash took place outside her home when Cooper was there, Neal told other drivers who wanted to call an ambulance that she did not have a phone. Nine months into the affair, Rocky figured it out and forced Cooper to admit it. Since he refused to choose, Rocky tried to wait it out, hoping that it would burn out. When Neal became pregnant, he arranged for her to have an abortion, knowing that their careers would never survive otherwise, even though this would have been a perfect excuse to leave his wife. His ex-lover Ingrid Bergman had just had an illegitimate child with director Roberto Rossellini, and her career had immediately nosedived. Separated from his wife for three years because of his affair with Neal, Cooper had yet another affair with Grace Kelly during High Noon. The affair with Neal finally ended in 1951, partially because the stress of having to choose between two strong women was giving him ulcers. After his relationship with Neal ended, he made several movies overseas to get his head together and to avoid paying taxes, where he had further affairs with Lorraine Chanel and Gisele Pascal. Despite returning to his family in 1954, he had a public affair with Anita Ekberg in 1955. Like many actors, Cooper did not embrace playing his age on screen. Friendly Persuasion (1956) was the first time that Cooper played a father, which he resisted even though he was fifty-five-years-old at the time. Along with Sgt. York and High Noon, it was one of his three films with a pacifist theme. Cooper did have enough of a sense of humor to star in Love in the Afternoon (1957), which mirrored his life rather closely, and showed a willingness to test himself. Before High Noon (1952), Cooper had not had a hit since For Whom the Bell Tolls in 1943, largely because Warners had not given him good scripts, so he was no longer one of the top ten box-office performers. As a result, he was willing to accept a much lower salary and a share of the profits to do High Noon. Cooper and director Fred Zinnemann stood by writer Carl Foreman when he was blacklisted, although producer Stanley Kramer tried to sever his connection to ensure the film’s success. Exposure to Foreman and Neal had softened his previous hard conservative stance, so Cooper’s attitude had changed since he initially testified before HUAC four years before. However, in the end, Cooper bowed to the pressure of the studios and did not go through with his plan to invest in Foreman’s production company, a decision that was supported by Foreman. In the end, Cooper won an Oscar and made $600,000 from the film. The success of High Noon encouraged Cooper to return to westerns. Cooper’s health had been failing throughout the 1950’s, and he had surgery for prostrate cancer in April 1960. The surgery did not stop the cancer from spreading, but it remained a secret until Jimmy Stewart broke down while accepting an honorary lifetime achievement award on behalf of Cooper, and newspapers announced the news the next day. He died on May 13, 1961, and left an estate worth $3.5 million. A stranger comes to town and is elected sheriff in order to oppose a crooked judge whose gang is rustling cattle. Two young fighter pilots with the American Expeditionary Corps in France during WWI are rivals in the air and on the ground since they are in love with the same woman. The daughter of a French widow falls in love with an American pilot whose squadron is based next to her mother’s farm during WWI. In 1840, a mountain man falls in love with a beautiful Mexican woman but is torn between his love and his wanderlust. The foreman of a local ranch is forced to hang his best friend for rustling cattle and eventually takes his revenge against the outlaw who lured his friend into the outlaw life. An American member of the French Foreign Legion begins an affair with a local saloon singer even though neither one is really able to trust the other and they both know they would be better off without each other. In 1862, a young frontier scout guides a wagon train from Missouri to California, while fighting off Indians stirred up by a renegade white trader. An American ambulance driver falls in love with a British nurse in Italy during WWI. Two friends since childhood plan to marry but sleep together before becoming engaged. The situation becomes more complicated when she falls in love with another pilot in her boyfriend’s squadron during WWI. A Union spy poses as a Confederate sympathizer to learn military secrets but falls in love with a Confederate officer who is assigned to track down and kill the spy. The 41st Bengal Lancers gaurd the Northwest frontier (the modern border between Pakistan and Afghanistan) of British India around the turn of the century. The colonel’s son joins the regiment without his permission just as a bandit leader is trying to stir up rebellion. Set in 1920s Kuomintang China, an American mercenary agrees to buy weapons for a provincial government to oppose a local warlord but he falls in love with the daughter of a man who serves the warlord. With the Civil War over, President Lincoln wants to develop the western frontier and enlists Wild Bill Hickock to help tame the frontier. Joined by Buffalo Bill Cody and Calamity Jane, they struggle to prevent a white arms merchant from stirring up the Cheyenne into rebelling. While battling slave smugglers in 1842, two sailors find themselves on a sinking ship without enough lifeboats, so one of them must decide who lives and who dies. Marco Polo travels from Venice to Peking, China, where he falls in love with the daughter of the emperor, Kublai Khan. Three brothers are adopted into an upper-class household but when the family heirloom disappears, they confess to the crime and join the French Foregin Legion, where they find that their sadistic sergeant is as much of a threat as the rebellious Arabs. When the American army leaves the Philippines in 1906, a few officers remain and try to train the local police to oppose the Moro, zealots who want to establish a Muslim state. A drifter becomes friends with Judge Roy Bean, but they find themselves on opposite sides when fighting breaks out between the ranchers and homesteaders. A Texas Ranger travels to Canada during the 1880’s in search of a fugitive and finds himself mixed up in the Riel Rebellion. An American adventurer joins a band of guerrillas that opposes the Nationalists during the Spanish Civil War. When Japanese forces overrun Southeast Asia during WWII, an American doctor disobeys orders to leave the seriously wounded behind and attempts to evacuate them from Java. Near the end of WWII, an American physicist is sent by the OSS to Switzerland to meet a former colleague and determine how much the Germans know about atomics. A fur trader is trying to incite an Indian rebellion in the hope that they will drive out the American colonists and British, leaving him in control of the fur trade in the Ohio Valley. He is opposed by a settler who tries to both persuade the Indians to remain peaceful and save a woman who was illegally condemned to become an indentured servant. An American Naval officer struggles with little success during the 1920’s and 1930’s to promote the power of aircraft carriers until Pearl Harbor gives him the opportunity to prove his theories. A former Confederate officer changes identities with a marshal from the East who does not know how to use a gun in order to gain revenge on a Texas rancher who burned his plantation during the war. During the 1840 Seminole War in Florida, an American scout is assigned to lead a special force of scouts to destroy a Spanish fort where Cubans sell weapons to the Indians. They easily destroy the fort and rescue the hostages but find themselves hunted by the Seminoles as they flee through the Everglades. As a marshal prepares to start his honeymoon with his new bride, he learns that an outlaw he sent to prison has been released and is coming with three other men to kill him. When he tries to form a posse to capture the men, he finds that no one is willing to help him. During the Civil War, a Union officer pretends to be discharged from the army for cowardice in order to catch the Confederate raiders who have been capturing shipments of badly needed horses, and find out who is their secret informant. A community of Quakers in Indiana in 1863 struggle to remain true to their belief in non-violence when Confederate raiders under General John Hunt Morgan arrive. A homesteader traveling by train to hire a schoolteacher for his community finds himself stranded when the train is robbed, so he is forced to seek help from the outlaw gang that he used to ride with. 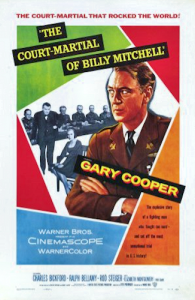 Gary Cooper: An American Hero-Jeffrey Meyers, New York: William Morrow and Company, Inc, 1998. Prepared with the enthusiastic participation of Cooper’s daughter Maria, it is the first biography on Cooper in almost 20 years. It combines a good, incisive look at Cooper’s career with a solid analysis of the environment in Hollywood at the time. The involvement of Cooper’s daughter naturally limits the hard-hitting nature of the book, but it is still the best of the available biographies on Cooper. The Last Hero: A Biography of Gary Cooper-Larry Swindell, New York: Doubleday and Company, Inc, 1980. Swindell produced a well-written and well-researched examination of Cooper’s rise to stardom and his busy love life. Although superseded by Meyers’ more recent work, anyone seriously interested in Gary Cooper will find it worth reading. Coop: The Life and Legend of Gary Cooper-Stuart Kaminisky, New York: St. Martin’s Press, 1980. The weakest of the three biographies, it covers his life until he becomes an extra in Hollywood in one chapter and is a bit prudish towards Cooper’s sexual exploits, ignoring affairs with Dietrich and Lombard, while skimming over Lupe Velez and Countess Di Frasso. Instead, Kaminsky focuses on disproving the myth that Cooper only played one character and attempts to show that he altered each performance to suit the character.